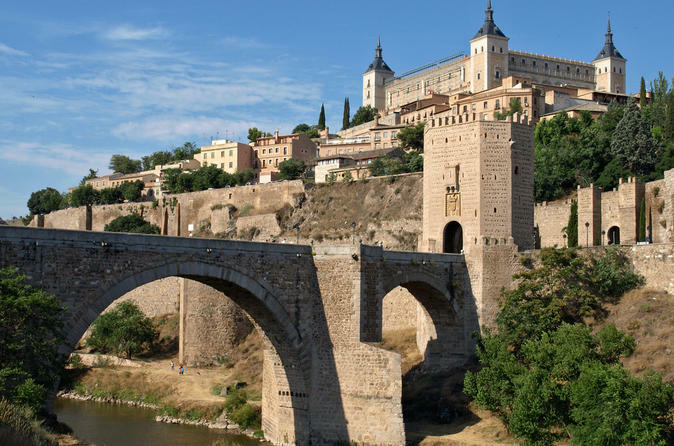 Discover the rich cultural tapestry of Toledo on an informative and independent day-trip from Madrid. Travel by high-speed train to the sparkling city then set out to explore the sights on both a city coach tour. Enjoy free entry to four alluring attractions such as the Santa Maria la Blanca Synagogue and the Church of Santo Tomé and dine upon a delectable 3-course meal at one of the city’s most established eateries. Time is no constraint during your independent exploration as you can travel back to Madrid at a time suited to your schedule. Climb aboard your high-speed train at Madrid Atocha Station and embark upon your journey to the ancient and attractive city of Toledo. Enjoy the scenery during the short 30-minute journey then disembark and begin your independent exploration. Use your Toledo sightseeing pass to gain free entry to the Church of Santo Tomé, Santa Maria la Blanca Synagogue and San Juan de los Reyes Monastery. Enjoy skip-the-line admission to Primate Cathedral of Saint Mary of Toledo with your priority access pass. Gain fascinating insight into the stories that shroud the city’s most significant sites on your comprehensive city tour; climb aboard a comfortable, air-conditioned coach and visit landmarks such as the Primate Cathedral of Saint Mary of Toledo, home to a collection of artistic masterpieces that spans from the 13th-century to present day. Take advantage of your sightseeing ticket to travel between legendary landmarks like Puente de San martin and Plaza de Zocodover. Take photos at specific stops in order to ascend the Mirador El Valle (a vertiginous viewpoint of the Tagus River) and to explore the colourful Los Cigarrales neighborhood. Conclude your delightful day with a delectable 3-course meal in La Abadia, Mercado de San Agustín or El 10 de Santo Tomé restaurants; select Spanish specialties from a set menu then return to Madrid at a time convenient to you.